Prepare to be amazed by this stunning drone video of the northwestern Amazon Rainforest, compliments of contributor AlTheGreat. This vast jungle is one of the principal geographical features of South America, comparable in importance and larger in extent than the Andes Mountains system. It covers an enormous area of over 5.5 million square km (about 2.1 million square mi. ), about 75% of the area of the Amazon River Basin. The western and northwestern reaches of Amazonia (as it's sometimes called) lie in Peru and Colombia. 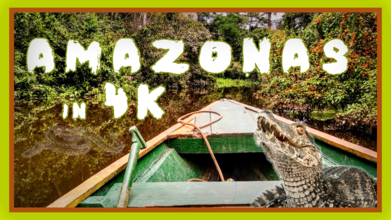 Description: I had the opportunity to travel the beautiful Colombian and Peruvian Amazon and stay with the local village of Gamboa in the Amazonas Jungle. All footage was captured in 4K 30 fps with 10 bit color dlog and color corrected in post production. Filmed using H265 and exported in H264 to reduce file size. The rough cost of this production was $300 excluding airfare and other travel expenses.